The groups sued the state on the grounds that the abortion ban is racist and unconstitutional, but their lawsuit was dismissed by the lower courts with the reasoning that neither group had grounds to claim damages. In other words, the courts did not believe that the use of racist stereotyping to whip up fears of women of colour in Arizona to justify passage of an unnecessary and restrictive abortion ban actually hurts women of colour. Yesterday, NAPAWF, NAACP and ACLU received more devastating news. Their appeal to the 9th Circuit Appeals Court was also dismissed, again on the grounds that racism doesn’t really hurt communities of colour (see NAPAWF executive director Miriam Yeung’s reaction video above). 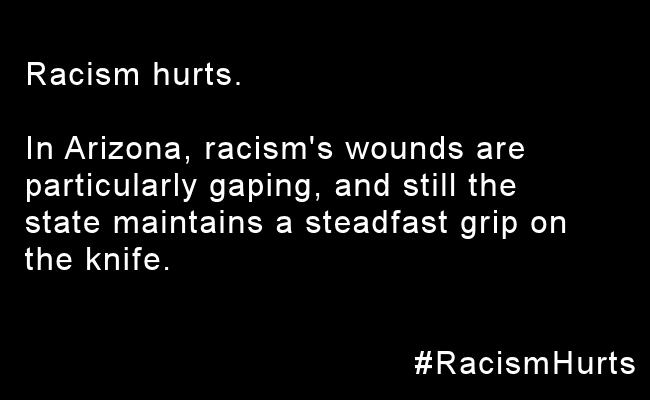 I’ve got news for the folks in Arizona: racism hurts. Racism hurts a lot. “These laws stem from racist stereotypes that Asian-Americans do not value women and girls and that black and Asian-American women can’t be trusted to make our own reproductive health decisions,” Miriam Yeung, executive director of NAPAWF, told reporters on Wednesday. When state senators use racism to limit constitutionally protected abortion access, they engage in racist stereotyping that hurts all women. What’s particularly galling is that this is Arizona, where the fact that racism hurts communities of colour should not be the least bit surprising. This is a state that defied the federal government to institute a policy of racial profiling targeting brown-skinned people; where Mexican American studies were banned as “discriminatory” and “divisive” towards White students (but other ethnic studies programs were left largely untouched); where racial disparities in K-12 education are among the highest in the country; and, where voters passed a measure to ban race-conscious affirmative action. Racism hurts. In Arizona, racism’s wounds are particularly gaping, and still the state maintains a steadfast grip on the knife. In her reaction video (above), Yeung says that ACLU lawyers are in the midst of considering their options after yesterday’s devastating dismissal of the civil rights groups’ case against Arizona. However, she urges concerned supporters like us to continue their financial and advocacy support of NAPAWF and other groups. You can speak out on this issue by renewing your tweeting to #RacismHurts in the wake of last week’s Twitterstorm (Storify).